Metal detectorist in Buckinghamshire have unearthed one of largest hoards of ancient coins ever found in Britain. 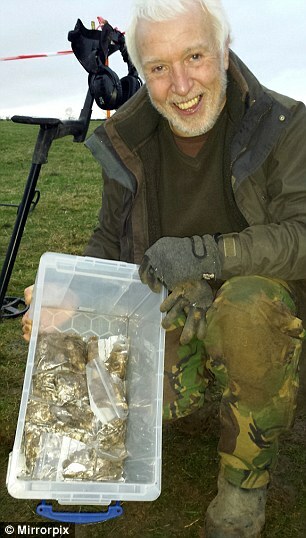 Paul Coleman from the Weekend Wanderers Detecting Club discovered 5,251 coins buried inside a lead container two feet deep near Aylesbury. The hoard contains specimen dating back to the 11th Century – the late Anglo Saxon, early Norman period. The coins will now be examined by the British Museum. Mr Coleman, from Southampton, was taking part in a dig in the Padbury area on 21 December when he found the 5,251 coins depicting the heads of kings Ethelred the Unready and Canute. It is thought the hoard might be worth over £1 mln. Paul Coleman found this hoard using an XP Deus metal detector. You will find the whole range of XP Deus metal detectors and accessories in Regton store. ← Medieval treasure in a button box.